That’s how it all started. A simple question, a few quick words that lead to sweat evaporating out my pores in 129 degree heat, driving 3 days through the desert with no air conditioning, and cuddling with three other guys under a single emergency blanket to make it through a 30 degree night on top of Mount Whitney. 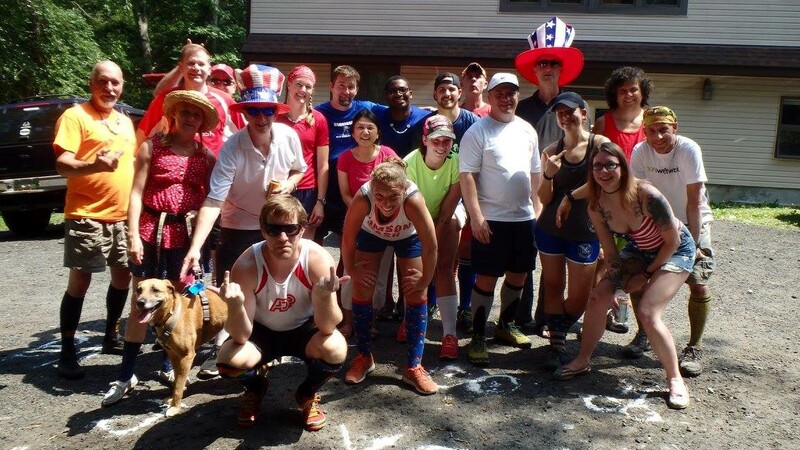 “What are you doing in July?” Crewing the Badwater 146. Luis Escobar and Mauricio Puerto planned to run from Badwater Basin (the lowest point in North America) 146 miles to the top of Mount Whitney (the highest point in the lower 48 states). That was all I needed. I was in. 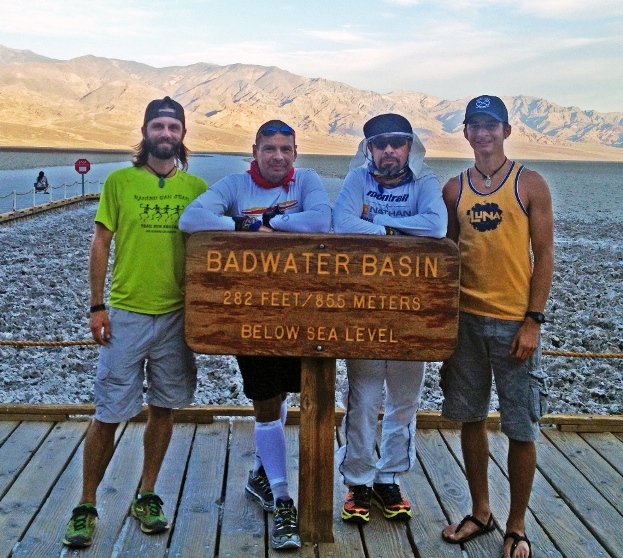 Many of you may be familiar with the Badwater Ultramarathon, “the worlds toughest foot race”. 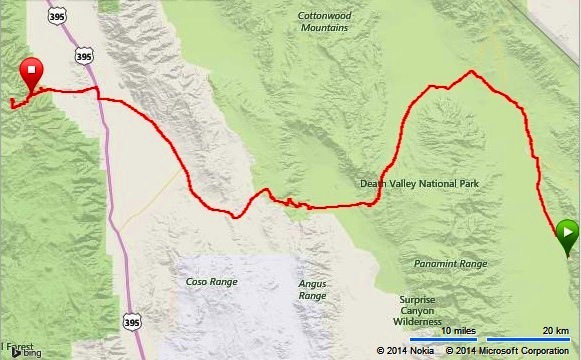 A 135 mile course starting at 282 feet below sea level in the Badwater Basin of California’s Death Valley and ending at Whitney Portal, just below Mount Whitney. 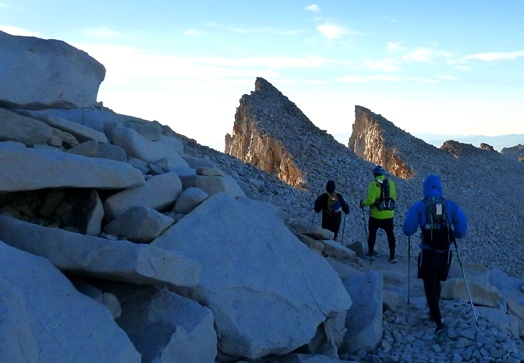 We would be running a similar course, just adding an additional 11 miles (and 6,000+ feet) to climb to the top of Mount Whitney. According to the Badwater 146 website only 260 people have ever finished the 146 mile traverse from the low point to the high point. This would take some work. 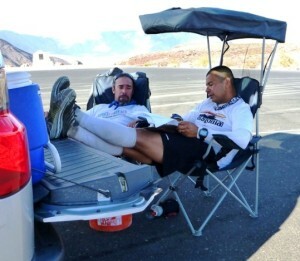 A few days before the trek Luis secured another crew member (thank goodness) and Greg Ponce joined us in Death Valley. I asked Greg how he got there, he said Luis called and asked ìDo you want to do something epic?î Sold. 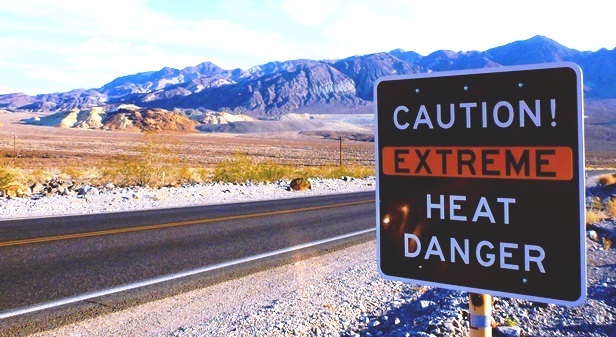 It gets hot in Death Valley…real hot. Friday morning July 18th I woke up extra early in Prescott, Arizona. I put in a couple hours of work from my Grandpa’s condo before hitting the road to California. I drove a hundred miles and stopped at a McDonald’s to use the WiFi and do another 2 hours of work. I drove again, passing Hoover Dam and Las Vegas before stopping at yet another McDonald’s and a few more hours of work before turning off the laptop and escaping for the weekend. Luis, Mauricio, and Greg were all driving from the Santa Barbara area and would meet me in Death Valley. I made it to our rendezvous point, Panamint Springs Resort, and bellied up to the bar for a beer and a little more work on my laptop (yah, more work, but after that I really did turn it off!). The plan was to meet at 9:00 PM but I knew the guys needed to go shopping for supplies in Mojave, so I didn’t worry when I waited and waited and waited. Eventually I wasn’t sure if I was in the right place. It was now 10:30 PM, the restaurant had shut down and Iíd been laying on the tailgate of my Honda Element watching shooting stars streak across the dark desert sky. I wasn’t in a hurry, but wondered if I was supposed to actually meet them on the other end of Death Valley. I was happy to sleep right there for the night, but was more concerned about Luis and Mauricio. 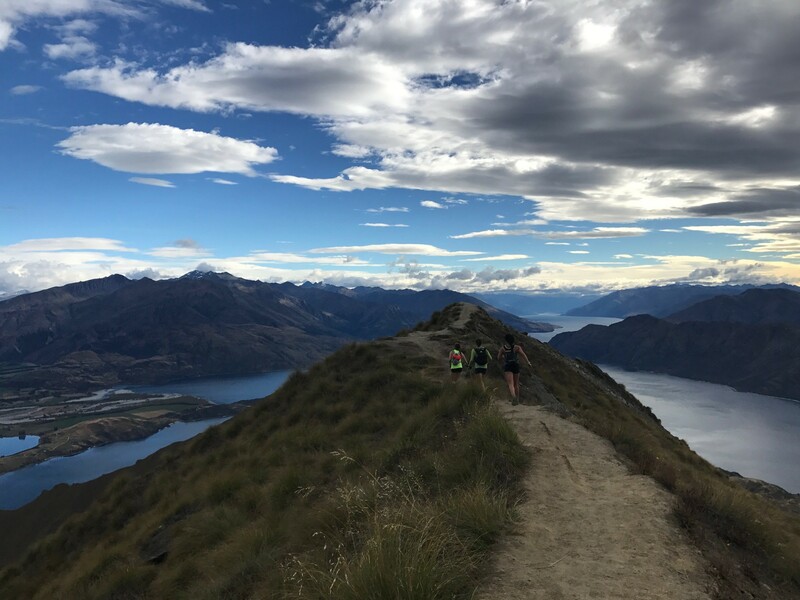 I didn’t want to screw up the meeting plans, and more importantly, the sleeping plans, the night before starting their 146 mile run. I looked at the map and decided I should try to get on top of a mountain to try to get cell reception. I drove 15 minutes up a pitch black mountain road and picked up no signal. Then I realized that there were 2 ways into Panamint Springs, and I had no idea which way they were coming from. I hurried back down the road and pulled in just in time to see Luis’ truck making a loop around the campus. Found. We put my gear into Luis’ truck and drove to Stovepipe Wells to get a motel room for the night. By the time we checked in, unpacked a few items and crawled into bed it was getting close to midnight we would be up early, very early, the next morning. Luis asked Greg, just a kid all of 20 years old, ìHave you ever shared a bed with a grown man?î I jumped in Mauricio’s bed and left Greg to deal with Luis and with that the weekend adventure was underway. We could barely hear the alarm clock over the constant drone of the air conditioning unit working hard to beat the 90 degree heat outside the motel room door. It was 4:30 AM but already hot. We gathered gear, reorganized the truck, and filled anything we could with ice from the motel. By 6:00 AM we were packed in the truck and on the way to Badwater Basin, the lowest point in North America. At the edge of a flat valley sits a small parking lot, a sign, and a park service bathroom. That was it, our starting line (the sign, not the toilet). As we walked to take a photos with the Badwater sign I asked ìLuis, does your truck always leak this much water?î Problem. We took a closer look and the coolant reservoir was bone dry. Completely empty, which would explain the rapidly evaporating puddle of fluid on the ground under the truck. Not a good sign normally, but a very big problem in the middle of Death Valley at the start of a 146 mile run across some of the most unforgiving terrain in the world. Luis recognized a guy taking photos by the sign. 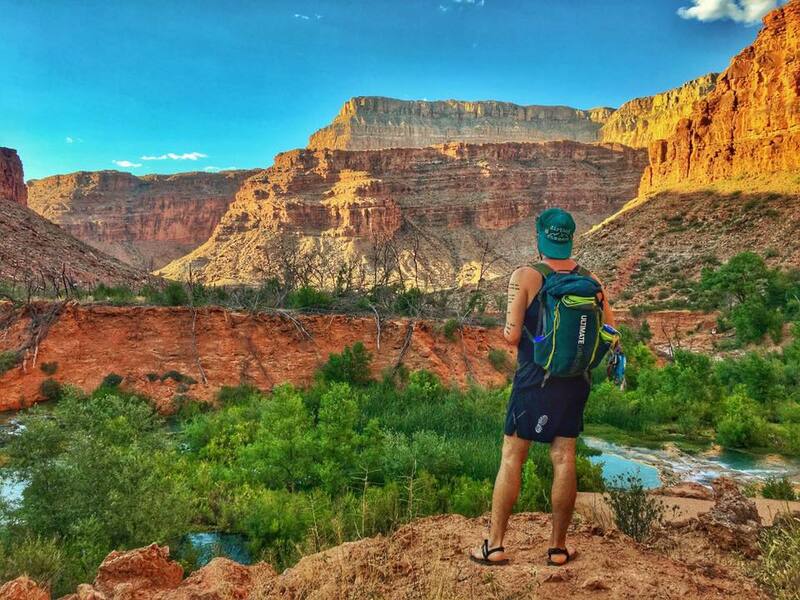 Ray Sanchez is a very accomplished ultrarunner and was registered for the Badwater Ultramarathon starting on Monday morning. He was at Badwater with his fiance doing a quick 10 mile “fun” run in Death Valley. Ray took a look at the truck and offered to give me a ride from Furnace Creek to Panamint Springs Resort to pick up my car. We hadn’t even covered the first mile and the plans had drastically changed. Ray took off to run and Greg and I snapped a few photos with Luis and Mauricio. We filled their water bottles with ice and water, said “go”, and they were off. It was 6:55 AM on Saturday, July 19th we would be running and crewing for the next 4 days until we would finally come back down from the top of Mount Whitney just before noon on Tuesday, July 22nd. Greg refilling the fluids in the truck. Greg and I moved ahead, found a wide shoulder on the side of the road, parked the truck, got the chairs out and waited. We could see 2 white specs on the road behind us and watched as Luis and Mauricio wound around the foothills of the Badwater Basin. When they reached the truck we filled up their water bottles, gave them food, and they were off again. We packed up the chairs and drove another 2 miles down the road. Just 10 miles and 5 pit stops in Ray finished his run and I hopped in his car to hitch a ride to Panamint Springs Resort. Ray has run every 135 mile race course around the world, plus a multitude of other ultra races. We spent the next hour talking about racing and adventures and he gave me invaluable advice on how to crew Luis and Mauricio over the next few days. Keep them eating and drinking, keep them cool, stay near them, never lose sight of them. Ray was pushing for a top 5 finish at Badwater in a few days. 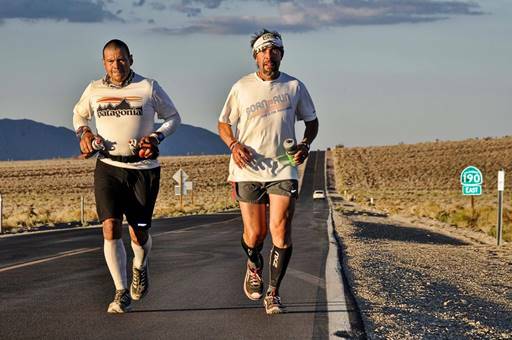 It was an amazing experience to finish the 146 mile trek with Luis and Mauricio on Tuesday and then watch Ray make his goal and finish number 5 in the 2014 Badwater Ultramathon. Congrats Ray! 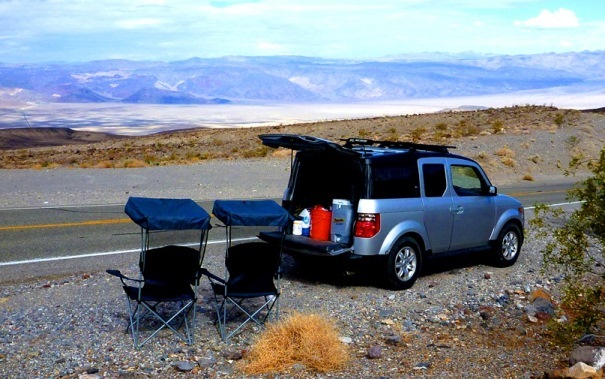 When we reached Panamint Springs Resort, Ray dropped me off and I got in my car and headed back 55 miles across Death Valley to find our caravan. The long drive in the desert and the short night of sleep left me dozing behind the wheel. Before Stovepipe Wells I pulled off the side of the road, leaned the seat back and fell asleep. I didn’t set my alarm, I just rolled down my windows and waited for it to become so hot in the car that I woke up in sweat. Ten minutes later I couldn’t stand it, I sat back up and started driving again, cranking the air conditioning, the last time I would use the AC for the weekend. I saw Luis’ truck on the side of the road and made a u-turn. Greg was sitting behind the truck in a thin sliver of shade. The pace had slowed a bit with the sun and the climbing thermometer. Greg was now stopping at least every mile to refill water bottles with ice, spray the guys down with water, and dip their hats in ice water. We began the long march across Death Valley. Drive a half mile or so up the road, pull over, get the chairs out, set them in what little shade we had beside the car, fill water bottles with ice and water, prep the water mister, grab some snacks, and wait. Luis and Mauricio would approach and we would take gear to their side of the road (they were running against traffic) and give them what we could. Inevitably they would want something we left in the car, or want nothing of what we had, so there was a lot of back and forth during the 60 seconds we would see them. And then, just like that, they were gone. We would pack up the ice chests, food bags, gear bags, chairs, and anything else we had pulled out, close up shop, and drive up another half mile or so and start the process all over again. At one point I placed a thermometer that I brought in the sunlight as we waited for the runners. It topped out at 129.9 degrees. Dry heat? Funny. By no means do I want to compare crewing in Death Valley to running in Death Valley, but like The Jester explained in his blog post above, itís no walk in the park. Would you like to stop every half mile or mile of a 135 mile drive, pull everything out of your car then put it back in, all in 120+ heat, for 3 days straight? Sound fun? 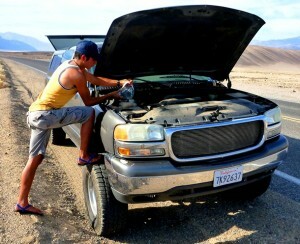 We continued on in this fashion, leapfrogging the miles and pampering Luis’ truck so it wouldn’t overheat. The next desert oasis was Stovepipe Wells, the motel we had stayed in the night before. Stovepipe Wells, mile 42, would treat us with a gas station, mini mart, fuel, and a pool. Yes…a pool in the middle of Death Valley. We still had our room key and would be using it to take a dip in the water to cool off. No corn in this corn field! Before we could practice our cannonballs in the motel pool we had to get the runners through some of the toughest parts of the road. 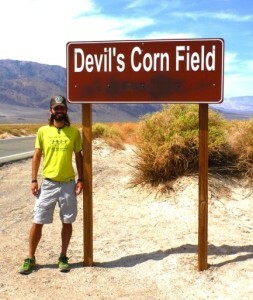 We passed a section of the valley called “Devil’s Cornfield”. I grew up in Indiana and this did not look like any cornfield I’d ever seen in my life. Besides, if there had actually been corn there it must have popped a long time ago (these are the kinds of jokes I come up with during long hours crewing ultramarathons). This section of the road plays host to gnarly crosswinds blowing dust and sand continuously at runners. We rounded the corner, passed some massive drifting sand dunes, and made the last push for Stovepipe Wells. Once there Luis and Maurio went to the pool while Greg and I filled the vehicles with gas and bought over $100 in water and ice, 18 bags to fill 5 coolers. Once our chores were done we changed into running shorts and dove in the pool. I had exactly 4.75 minutes to relax before Luis and Mauricio were up, finishing dinner, and ready to head out. No need to towel off after the pool, I was dry within minutes. It was early evening and dusk was settling in as we caravanned out of Stovepipe Wells. From here we needed to climb Townes Pass, almost 5,000 feet above the desert floor (I say ìweî loosely, Mauricio and Luis climbed, we drove). We knew that eventually everyone needed to sleep, but we didnít know when. We weren’t in a race, we had no real time goals, the point was to finish. The last rays of sunlight faded to black and Mauricio and Luis donned their reflective vests for a night of running along a highway. Greg and I continued our half mile, mile leapfrog routine, inching our way up the mountain to the pass. Around 10:30 or 11:00 PM the runners called it. We were all tired from a lack of sleep the previous night and we all needed rest. We found a wide turnout off the road, parked the trucks and set up camp. Greg and I slept in my tent, Luis passed out on his truckís tailgate, and Mauricio sprawled out on a tarp on the ground. A short 4 hours later we were up at 3:00 AM, making coffee, packing up gear, and moving forward. Greg and I moved the vehicles up the road and Mauricio and Luis followed. Within a few stops the gray light started to replace the desert black, and then the sun began to rise over the horizon. We were treated with a rainbow literally positioned at the top of the pass we were climbing. The morning started out comfortable, but it wouldn’t be long before the heat would return. We reached the top of Townes Pass and devised our next plan. We were still coddling the truck, refilling the coolant reservoir with water and driving it slow. 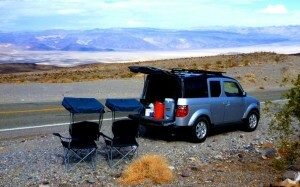 We decided to send Greg down the mountain to Panamint Springs Resort to park the truck and sleep for a few hours. Greg took off, leaving all of the gear for the guys in my car. I was on my own. The next few hours were a mix of driving ahead, parking, pulling everything out, crewing for 60-90 seconds, repacking, driving another mile down the road, and doing it all over again. What did Einstein say? Doing the same thing over and over again and expecting different results is insanity? Well, I was expecting the same result each time, but there may still be an argument for insanity in the repetitive nature. After Townes Pass we dropped over 3,000 feet to another valley leading to Panamint Springs Resort. It was midday again and we were in the heat of it. Runners had begun passing through Death Valley heading for Lone Pine, headquarters for the Badwater Ultramathon. Several had stopped to ask who was running and offer words of encouragement. One van pulled over at the bottom of the pass and rolled down their window and asked “How are our brakes?” “On fire!” I said. “Who is out there running?” they replied. “Mauricio Puerto and Luis Escobar!” I answered. “Your brakes are really on fire. There are flames coming off of them!” I emphasized. In no time they were out of their van dousing their brakes with water bottles. At least it was a rental. A little later another car pulled over and a guy hopped out to talk with me. “Who are you crewing?” he asked. Luis and Mauricio I said. We chatted as he waited for the guys. He introduced himself, “My name is Marshall! I was standing in Death Valley, during July and August, and stranger just pulled over and introduced himself as Marshall. I knew who he was and didn’t need his last name. We chatted as we waited for Luis and Mauricio to arrive and I took down suggestions and advice on how to crew in Death Valley from Marshal Ulrich (Marshall’s Website), 18 time finisher of the Badwater Ultramathon, crossing Death Valley 24 total times, including a 586 mile Quad-Badwater where he covered the course in 4 conductive passes. He knows what he ís talking about, and I listened carefully. Luis and Mauricio trying to find shade. The previous day Greg and I were waiting for Luis and Mauricio when 2 cars pulled over behind us. A guy jumped out and asked which was Luisí truck. He had received word through the grapevine that Luis Escobar needed help to get his truck to a mechanic. A few other people emerged, including Lisa Smith-Batchen (news story) who had only days before finished the Quad-Badwater and was on her way to Lone Pine. These crew members and Lisa had been in Death Valley the past 2 weeks, marching back, and forth, and back, and forth for 584 miles. Amazing. They stuck around to say hello to Luis and Mauricio, then we confirmed that we had the truck situation under control and they headed off down the road. Back to Tuesday near Panamint Springs Resort. I was still crewing alone, helping the runners across the flat dry lakebed in the Panamint Valley when I saw Luisí truck pull up with Greg ready to help. He had been waiting for several hours as we descended the pass and came to help through the valley. 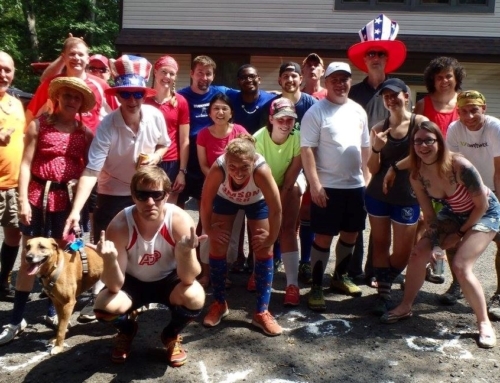 It is incredibly more efficient to have 2 people helping 2 runners. We made progress across the dry lakebed, stopping every half mile or so to cool the guys down and get more ice in their bottles. We had just moved ahead a half mile when a white car pulled off the highway behind us. I looked back and it was my brother Tyler in a rental car, he had just arrived from Vegas. The previous day we frantically sent out SOS texts to anyone in the area, seeing who could make it out to Death Valley to help our limping truck. Tyler was in Vegas with friends, went out on Saturday night and then rented a car early Sunday morning and left the glitz and glamour of the strip for a few days dirtbagging it in the desert. Our crew of 3 now helped spread out the repetitive labor and gave us options for the truck. An hour after Tyler arrived we hit the Panamint Springs Resort. There we found bathrooms, a restaurant, and resupply gas station. We sat in the restaurant and ordered burgers and fries, taking time to rest and refuel with proper food. At the table we all competed for dial up speed WiFi, checking emails and posting updates. 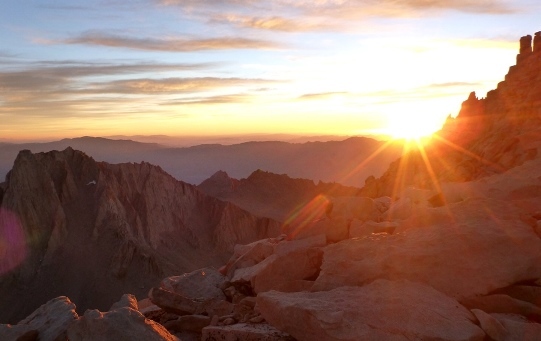 Greg checked the weather for Mount Whitney and sent an email to each of us. Suddenly Mauricio looked up and said “Who in the heck is Greg Ponce! ?” We all sat startled and Greg, sitting right across the table from Mauricio, said, “Me!” Greg had been catering to Mauricio’s every need the past 30+ hours but he didn’t even know his last name! We had a good laugh and chalked that up to another “Mauricio-ism” that we probably won’t let him forget. After eating food the guys prepared to take off and I headed to the gas station to fill our various buckets and coolers with another $60 of ice and water. I was leaving the store when the clerk said “I like your sandals!. I was wearing Luna sandals and I said thanks and grabbed the door. She called out “Barefoot Ted! A Born to Run book fan!” I hesitated, considered turning around to let her know that I had just purchased supplies for THE Luis Escobar from the book, but decided to let the moment pass. Back out in the desert Tyler and Greg stuck around to crew for the first mile but then headed off with the rental car and Luis’ truck to take it to Lone Pine and find a mechanic who could fix the broken water pump. While in town they also stopped by the ranger station and picked up 5 permits to climb Mount Whitney for the following day. In the meantime I solo crewed the guys as they climbed another mountain pass. The going was slow, but the temps cooled a bit and the views were spectacular. A few hours later Tyler and Greg made it back to us in the rental car. They found a mechanic who would work on the truck first thing Monday morning. With Greg and Tyler back in the mix I was relieved of my duties. I packed my gear in the rental car and drove 11 miles ahead to get some rest. The sun was just setting and I found a wide shoulder off the side of the road to park the car and I set up my tent at the bottom of a sandy hill that would block the headlights of passing cars as I slept. I had been passed out for about two hours when I was startled by someone’s voice right outside of my tent. Tyler and Greg had arrived and Luis and Mauricio were on their way. It was 10:30 PM and they all wanted to sleep. Greg slept across the two front seats in my Honda, Tyler used the other half of my tent, and Luis and Mauricio both sprawled out on the tarp next to us. Less than 3 hours later we were all up and moving again. The guys took off running while we broke camp. We descended another mountain pass and as the sun came up we could see Mount Whitney in the distance, our eventual destination. As we approached Lone Pine Luis and Mauricio sent me and Greg into town to pick up breakfast. The guys were hungry so we ordered two Big Deluxe Breakfasts from McDonald’s and headed back out. They downed the fast food and were soon dragging from eating too much. As we crossed Owens Valley I wondered what the farm equipment was doing out in the middle of the desert. It looked like they were tilling or planting across the parched valley floor. I later learned that Owens Valley used to be the home of Owens Lake, a 108 square mile lake between 20-50 feet deep. In the early 1900’s the Los Angeles Aqueduct took the water for Los Angeles, leaving a dry lakebed and creating the largest source of dust pollution in the United States. Today the Los Angeles Department of Water and Power operates a huge program to keep the dried lakebed wet and compacted to minimize the dust pollution. Oops? Our next stop was the ranger station at the junction of Highway 136 and 395. We pulled off and parked under the shade of a tree. A TREE!? We hadn’t parked under a tree in days! We definitely weren’t in the bottom of the desert anymore! After a short break the guys started running through downtown Lone Pine and we took the cars across town to refill water, ice, and snacks. We stopped at McDonald’s for ice cream and took it out to the runners as they started to climb the road to Whitney Portal. Tyler and Greg headed back into town to pick up a few more things and take care of Luis’ truck and I crewed solo again. Eventually the wind changed (or I just started paying attention) and realized that I smelled bad, real bad. I hadn’t taken a shower since Thursday. It was now Monday, and we had spent 3 days in the Death Valley. I found a creek and poured water over myself and used some wet wipes to shower on the side of the road. It helped. Kinda. The climb up to Whitney Portal is grueling. 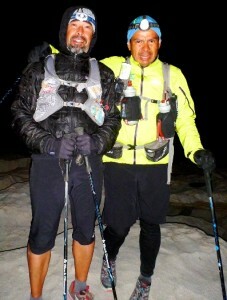 Luis and Mauricio made progress while we kept them hydrated and eating. In the late afternoon we rolled into the camp area and made it to the Mount Whitney trailhead, the finish line for the Badwater Ultramaraton 135 mile race. 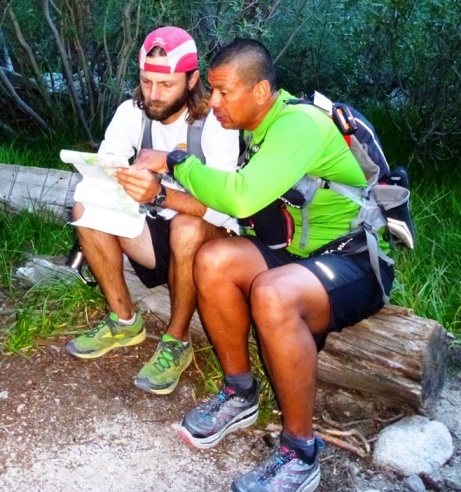 It was a great accomplishment, but we weren’t doing the 135 mile race, Luis and Mauricio still had 11 miles and 6,000 feet of climb for the Badwater 146. We parked the cars, ordered burgers from the camp store, and prepared trail gear for all of us. Luis sat us down and strategized a game plan. We are about to do something that isn’t entirely smart. We’ll be climbing Mount Whitney, the tallest mountain in the lower 48 states, at night, dead tired, in cold weather. So far we’ve had things under control, we had the cars, we had an out, but we are about to be out of control, this is where it gets serious. We set ground rules. No one hikes alone, we would hike in the same order the entire way up and if you were hurt or tired, you tell everyone immediately. No messing around, it was getting real. 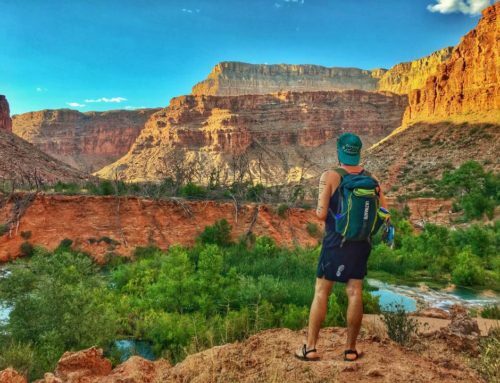 We stuffed our running packs with everything we thought we’d need. It was nearing 6:00 PM, we would definitely be running, hiking, climbing in the dark. Here is where I started making mistakes, mistakes that I would later seriously regret. 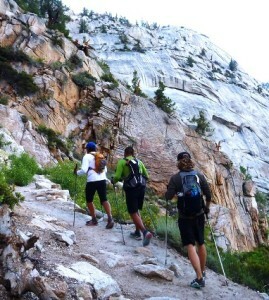 Tyler had come from Las Vegas with no gear, he even had to buy a pair of running shoes in Lone Pine for the hike. I gave him a backpack and he borrowed clothing layers from the other guys. They offered both of us running tights and I turned them down, for both of us. I figured that even if it got cold Iíd stay warm if I had upper layers and if we kept moving. I had enough upper layers for me, but when splitting them with Tyler we were cutting it close. Then, I recommended that Tyler leave my fleece and take my rain jacket instead as a wind breaker. All very bad ideas that would bite me, and Tyler, later. The 5 of us started up the climb. About a mile in Greg let us know that his foot was hurting and he didn’t want to risk messing things up on the mountain. We were still near the cars so we gave him the keys and he headed back down to wait at the bottom. Greg offered to give Tyler any layers that he wanted and I turned him down. I’m an idiot. Now I was making bad decisions for more than just myself. Luis and Mauricio lead, and by that I mean they pushed hard. They were 135 miles into this thing and I could barely keep up! I was dragging and the elevation was getting to my head. We hit the 99 switchbacks, a dizzying area of steep drops, quick turns, and huge elevation gain. I was beat. When we stopped for a break I laid out flat on the trail to try to catch my breath and calm my head. I was mad at myself, worried that I was dragging the group down when I should be helping support the runners I was crewing. Mauricio started worrying about me too and that made it even worse. Not only was I slowing them down, I was a huge liability for them. If I got worse Tyler would have to take me back down the mountain, leaving the two runners to fend for themselves (which wouldn’t have been a problem, they were both amazingly strong). About half way up the switchbacks a bright light appeared behind us, tracking our progress on the trail. I was lightheaded, but as the headlamp approached I swore that it was a naked hiker. He passed, I checked again, yup, naked. I confirmed with the rest of the group since I was starting to hallucinate from the altitude, but yes, the all agreed, that guy was naked. We finally crested the 99 switchbacks and the trail eased up a bit. From here the trail wound behind jagged cliffs, rock wall on one side and pitch black darkness beyond our headlamp beams on the other. This was a bit more technical and required a lot more focus to stay upright on the trail. After 6+ hour of hiking we finally climbed the last pitch and made it to the top of Mount Whitney, the tallest point in the lower 48 states. The celebration was brief but intense. Luis and Mauricio hugged, we celebrated with them and took a few photos. Congratulations, tears, and happy laughs were shared. Then it suddenly got real. 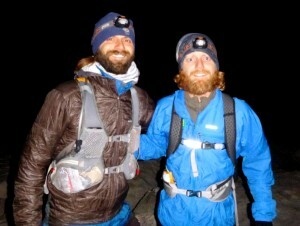 It was 1:30 AM, the summit was freezing with high winds and temps in the 30’s. I had turned down most other gear, so I was shivering as I stood, waiting our next move. After a brief celebration Mauricio took off down the north side of the peak, looking for the Mountaineers Route down the mountain. The trial we had climbed was a winding 11 mile route, but the Mountaineers trial was a much shorter, albeit very dangerous, 3.5 mile descent to Whitney Portal. Throughout the day Luis’ wife Beverly had been texting me and Tyler, telling us to NOT let Luis go down the Mountaineers Route. It was 1:30 in the morning, none of us were in shape to go back down 11 miles, and for some reason we thought we should take the shorter, more dangerous trail. After almost an hour of rock scrambling and trying to find the trail we gave up. It was now 2:30 AM, we were all frozen and shaking, tired, and frustrated. I was in a pair of running shorts with no lower layers and I absolutely had to get off that mountain to get warm. Mauricio and Luis were so exhausted that they absolutely could not hike another 11 miles in the dark and we had to stay together. We were staying put. We found the open door to the small Smithsonian Institution Hut on top of the summit and filed in. It was about 12 x 12 with one window and a wood floor. This would be home. We took off our running packs and used them as pillows. We put on every layer we could, then I pulled out an emergency blanket I had been carrying and we unfolded it across the 4 of us. I was still in just shorts and they put me in the middle to generate more heat. I was shivering uncontrollably and Tyler wrapped the blanket around me to raise my temperature. Within a minute Luis and Mauricio were asleep, snoring soundly. I shivered off to sleep and Tyler made his way under the emergency blanket. I woke up shortly after because my back was freezing. 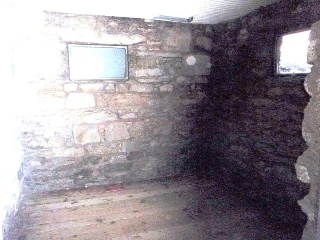 The floor had no insulation and I rolled over, laid on my stomach and folded my arms under my torso for insulation. I fell back asleep until I woke up with no feeling in my arms. I rolled back over and tried to move them, but they were completely dead. The rest of the night was a mix of me on my front and back, folding my arms to use as insulation, then rolling back over and holding them out as they tingled and blood ran back into them. Each time I moved the Mylar blanket creaked and cracked, waking everyone up not only in the hut, but probably within 5 miles of the summit. My feet were completely frozen. I had tried to add extra insulation by wrapping my legs in my rain coat, zipping it shut and putting the hood over my shoes. I think the hood helped insulate, but it also helped keep in all the condensation from my warmish feet, wetting my socks, and making my situation worse in the end. This is a lesson I should have remembered from the Appalachian Trial when I used my rain jacket over my sleeping bag, waking up to a soggy mess in the morning. I woke up a few times to eat more energy bars. On the Appalachian Trail we met an ultralight Triple Crown hiker who told us on cold nights to eat an energy bar before going to bed. The digestive process would work inside your body and elevate your internal temperature as the external temps dropped. Mauricio was freezing and eventually said “I’m sorry guys, but I gotta get up and do exercises.” So, at 3:30 AM, on top of the highest point in the lower 48 states, we tried to sleep while Mauricio did his calisthenics. We all tried our best to get any sleep we could. Four ultrarunners, huddled (cuddled) under one emergency blanket, spooning and rubbing arms and legs to try to stay warm. It is funny now, but it was scary as hell at the time. Being completely honest, I screwed up big time, underestimating the mountain and our tentative plans, but at least I brought an emergency blanket! The morning light eventually started coming in the window but no one wanted to move. Then we heard footsteps and a yell as someone reached the summit of the mountain. 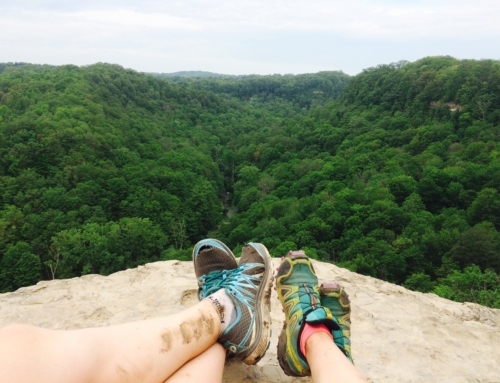 I was over being uncomfortable; it was time to get off this f-ing mountain. We all got up and packed our gear. Mauricio took off looking for the Mountaineers Route in the daylight, but after another hour of searching we couldn’t find it and resorted to going back the way we came. I supported this decision because I knew the Mountaineers Route would be dangerous, plus I would get to see everything I had missed as we hiked up in the dark the previous night. We were nearing the end of the trail shortly before 9:00 AM as we rounded a corner and saw two ladies ahead. I had been trying to run when females were around in an effort to look like a cool ultrarunner. We jogged ahead and the ladies stopped, “Luis!? What are you doing up here?” It was Jenn Shelton and Krissy Moehl. 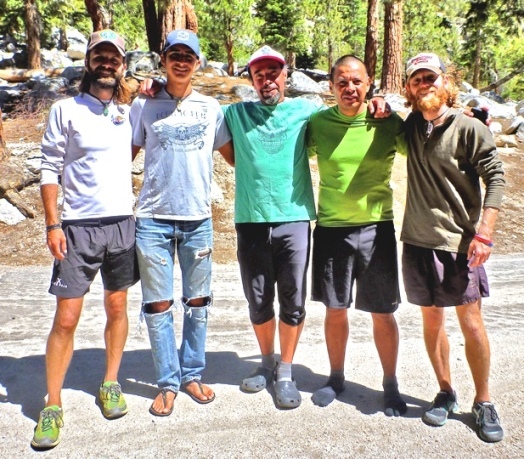 They had just left Whitney Portal two hours before and were at the beginning of their John Muir Trial Fastest Known Time (FKT) attempt. We talked briefly and then Jenn said “Well, we’re trying to get the JMT FKT, gotta go!” and they were off. 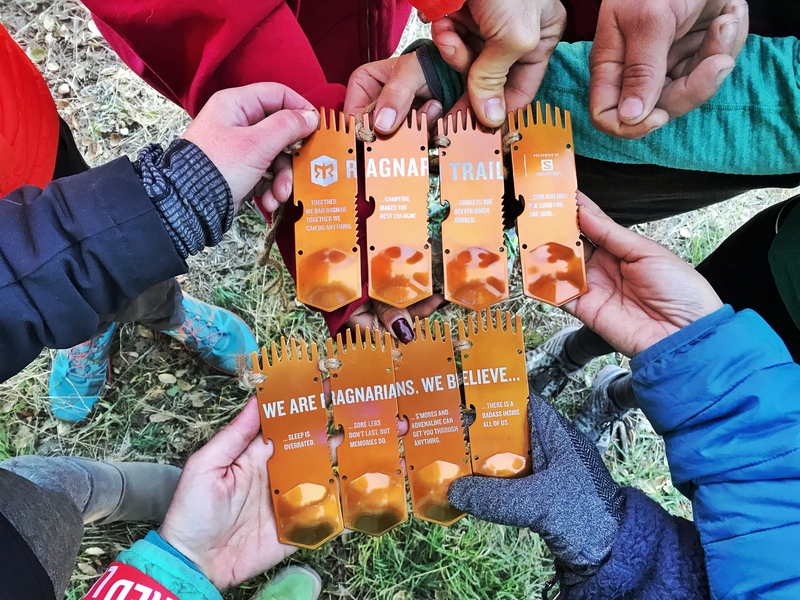 As we continued down the trail I told Luis “I like hanging out with you.” The weekend had been a sort of red carpet affair for ultrarunning, we ran into a lot of pretty amazing people with Luis. The 11 miles down seemed to take almost as long as the climb the previous night. We hit the end of the trail and our cars a little after 10:00 AM and found Greg posted up in a chair watching the finishers of the Badwater Ultramarathon. To continue the red carpet affair, Greg brought over Luis’ friend Badwater Ben Jones. 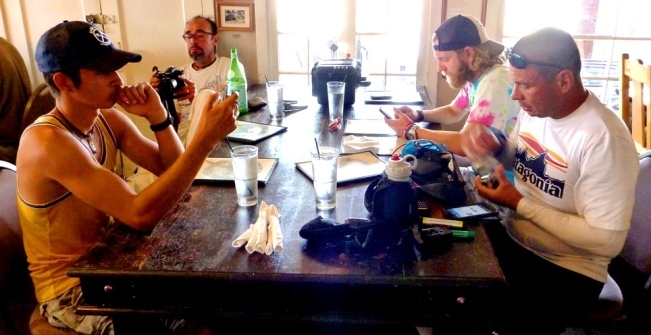 Ben talked with us and took a picture of the Badwater 146 runners and crew. He then asked about our summit. Luis mentioned that we had tried to come down the Mountaineers Route, but he was glad we hadn’t since Ben had told him about all of the autopsies he had done on people who attempted the Mountaineers Route (Badwater Ben is a local doctor who has performed more than 2,000 autopsies, I’m glad he didn’t perform mine). We changed clothes and shoes and hit the camp store for another round of burgers and beer. We were done, finally. Yes, we were sort of done when Luis and Mauricio reached the summit of Mount Whitney, 146 miles from Badwater Basin, but we still had to get our butts down off the mountain. Now, 4+ days after starting at Badwater Basin we were done. We sat and enjoyed calories and the fresh mountain air. Luis and Maruicio had done it. They had run 146 miles from Badwater Basin, the lowest point in North America to Mount Whitney, the highest point in the lower 48 states. We had crewed the whole way, which was taxing, but also very rewarding. I felt a great sense of accomplishment, not for myself, but for Luis and Mauricio. This adventure, this weekend, this time was about them. I felt honored to be asked to participate. The journey required a lot of trust, reliability, patience, and fortitude. I was grateful that Mauricio and Luis put their trust in us to help them achieve a lifelong goal. I wanted and needed nothing in return. As Ed Jester mentioned in his Badwater post, people will wait in line for the chance to crew Badwater. We had been hand selected by two great friends to join in a very low key Badwater 146 adventure. It can’t get any better than that. So, of course, the next question — is this crazy adventure on my bucket list now? Mom, you might want to stop reading here. Have you stopped yet? Don’t say I didn’t warn you! Hell yes it is! 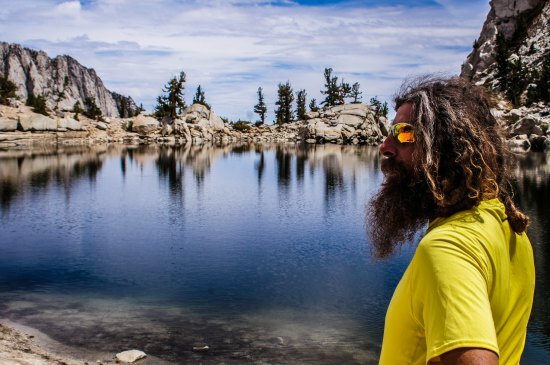 The Badwater 146 is hot as hell, crazy as hell, and puts you through hell. Which sounds like heaven to me. I was able to witness the raw adventure over the weekend. For me, that’s what life is all about.